Here’s the mobile versionof the FSX Day Cycle Calculator customized for iPhones and smart phones. When started, SHADE/Day cycle of today will be shown. Still, users can effortlessly select another day or month as with the desktop version. From now on, one can find out the SHADE/Day cycle of today in FSX, anytime, anywhere, even without a computer. Just bookmark the following link in the browser of the phone. I have Real Environment Xtreme (REX) installed for a long time but I didn’t aware that its freeware could bring additional enhancements to FSX until recently. I thought they were included in the package. Installation is as easy as snapping fingers. But DO REMEMBER to make a backup of the original grass texture file. Moreover, it may have barely perceptible impact to the overall performance. Just updated my Radeon driver to 11.9 for a few days. My impression from the overall result of the new driver is more or less the same as when I did the 11.8 update — no obvious increase in fps but feel a little bit smoother. Seems like the driver is getting better every time it updates. Maybe it is psychological since no direct comparison could be made. Anyway, don’t see any performance hit either. Settings for the 11.9 driver remain unchanged as in 11.8. Read some posts reporting the drop in fps after the 11.9 udpate. No idea what causes the issue but Rebuilding the Shader Cache may help. In particular for driver updates, I will beforehand backup both my Windows drive and FSX drive (using Acronis True Image) just in case. This saved me several times in the past. 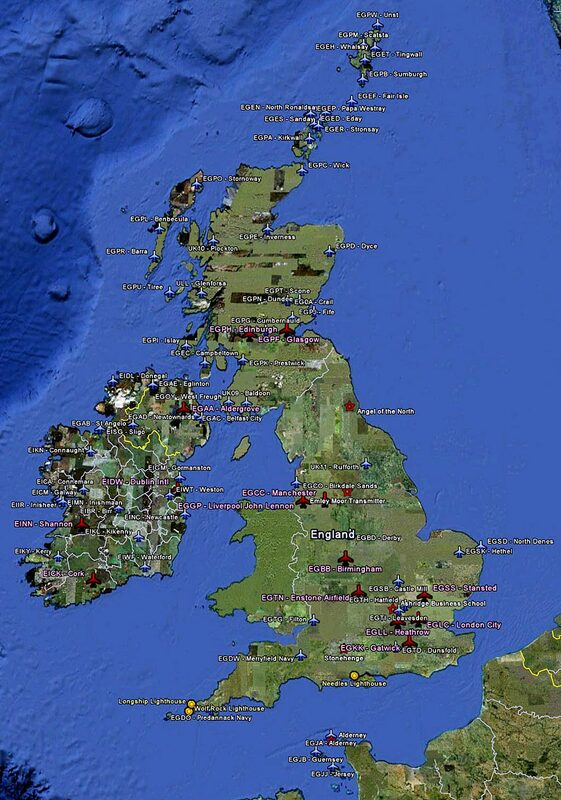 Here is the map for Airports in the UK and Ireland. Received quite some inquires about loading specific gauges onto multiple FIPs (Flight Instrument Panels) in desired order. Then the second FIP to the second last port; the third to the third last port, and so on. The FIPs are required to plug in this manner because the USB hub always starts the FIPs in reverse order from the last numbered port to the first numbered port. A new section — Posts Updated — has been created under HOME. All existing posts with additional or updated information will be listed there. Here’s the FSX Day Cycle Calculator mentioned in Post 112 about Finding the Day of Shade. Game Booster from IObit definitely isn’t something new. It is a small application that can temporarily stop unnecessary computer background processes and services, in order to give more computer resources and power to “boost” the performance of a game. Before the current version, I never liked the program because I encountered tiny bits of problems many times during the restore process. Although I have a Cyborg EVO Force from Saitek, I still prefer the XBox 360 Wireless Controller for all my helicopter flights. Certainly, the Xbox 360 controller doesn’t look flightsim-realistic as the Cyborg one but it has superb controllability and a fair amount of good features. As always, ONLY switch on (no plug in) the controller after FSX is loaded. This can prevent the occasional but common button mapping problem.